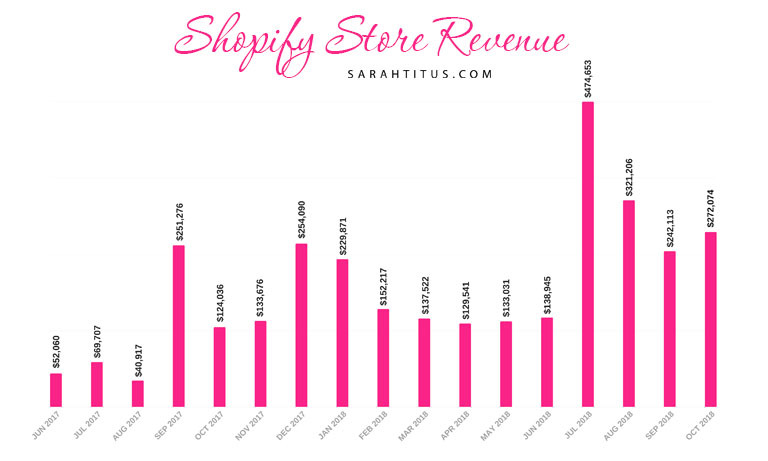 Today, I’m going to be sharing my Shopify store income report for October 2018 and by doing so, answer the question, “Can you make money on Shopify“. My newest binder out this month was a Genius Bloggers Toolkit Planner. It was designed to go along with the Genius Bloggers Toolkit that was a bundle on sale last month by Ultimate Bundles. Anyone who bought the toolkit would love to have this planner to go along with it to really help them not get overwhelmed by the amount of products offered in the toolkit. This month, 961 people downloaded the planner, so it did pretty good. I didn’t expect it to be downloaded a lot b/c it was just something that went ALONG WITH the toolkit. Not a stand-alone type of planner, however many of the sheets can be used for anything. Things like goal tracking, etc. This month I created a binders sale as a test. Many of the binders were free and/or $3 each. Priced extremely low, I made $5,973. This was an okay sale. I don’t feel like it generated enough income to do it again though. I ran the sale for two weeks (two newsletters). My first (of many) Shopify courses is set to go live Black Friday. So, of course I want to get it out to as many people as I can so that I’m always giving back and remembering my roots (I was homeless). As of November 7 (as I’m writing this post), 313 people have applied and I’m going through every single word that is written in the application form to find the best candidates for the scholarship as well as to glean insights into my brand. Big giveaways like this are something that I tend to do 1-2 times per year b/c I really LOVE hearing all the feedback I get from them. It’s so insightful and I use all the data to plan out my next 6 months of what I will be working on and releasing. In taking results from this survey, I’ve been able to meticulously calculate exactly what I will be releasing every week in my email newsletter from now until September 3 of next year! I have a BOATLOAD of binders and courses to release and it’s really exciting!!! 🙂 I’m stoked! I love having a plan! It was also a big nightmare to have TWO stores for a couple reasons. When talking to people they ask, “Hey, what’s your store?” and you have to constantly be looking for two links and explaining what they both are about, etc. Having two stores also messed up a lot of the apps. So, you’d be signed into one app and the app would break or freeze and mess up if you suddenly go to your other store. It was a mess and constantly a headache for me. But I think overall, having a second store made my efforts distracted. It’s harder to hold up two things rather than just one. It’s hard to be divided and feel split. What do I work on? Should it be the stock photos store or the printables store. I felt torn much of the time. There were several more littler reasons why I closed it but for the most part, those were the major ones. After closing the store, I feel a sense of RELIEF. I know what to focus on and life is simpler. I think it was a good choice for me. But I didn’t want to just leave it open doing nothing on it. So, I transferred ONE product, 50+ Styled Stock Library over to my printables store. I had my host put a redirect so that anytime anyone clicks a link to head to the store, they automatically go to that one stock library. Many people have been asking me how I SPEND all the money I make. B/c there were so many questions on it, I decided to make an entire post showing what I do with my income and what my current bills are, etc. If you’d like to check that out, you can see it here: What Do Rich Bloggers Spend Their Money On? 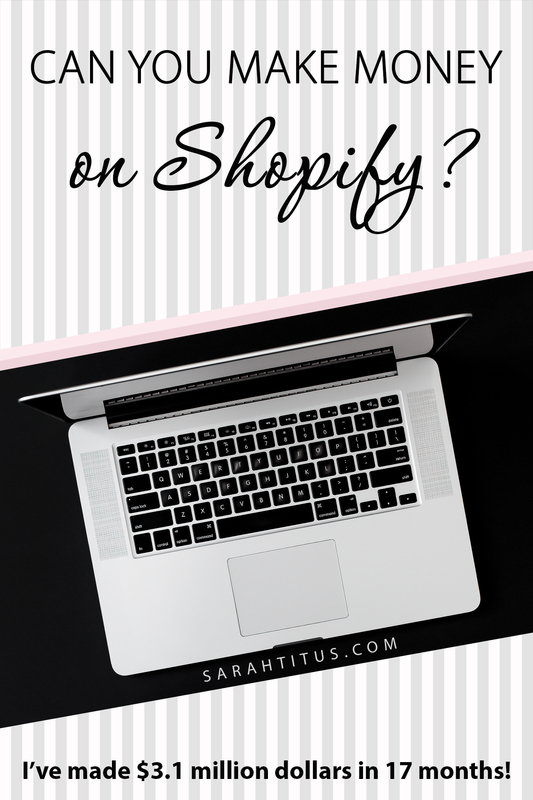 With being so successful in Shopify, I get asked a LOT of questions. I just LOVE to answer them too, so here are a mess of questions you guys have asked me this month! I totally get it. This is just my opinion but affiliate marketing comes off SCAMMY to buyers. They think we are just trying to make a buck and lie to get the sale. Creating our own products seems a lot more “legit” to consumers…at least from what I’ve seen. I believe affiliate marketing is dying off and our own shops are the next big thing. If I answer that, I’ll look like a complete loser…but here goes. lol. I worked my buns off for 3 years (working 80-120 hours a week, not a typo). I got tired. Wanted something more passive. Had an idea to sell something I could resell over and over and over again. Got my entire life set up on Todd Herman’s The 90 Day Year, so much so that I only have to work 10 hours a week now and my assistants (friends) work about 10 hours a week. 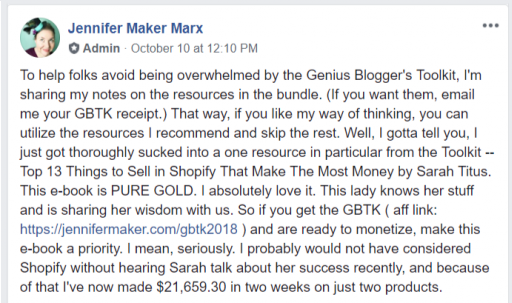 Jennifer Maker started with 2 products and made a total of $24,337.16 in her first 30 days on Shopify. Most of them I take the pictures myself. Some I create. Here are my favorite sources for stock photos. Honestly Shelly, I don’t bother too much with it. I put what is needed, a pain point if I feel like it. MOST ALL people DON’T READ descriptions…learned that in selling on ebay for 21+ years. 🙂 It’s a great idea to make it good, but, don’t hire it out or put a ton of thought into it. Short, to the point, and connect with your audience is really all you need. Dunno. I don’t advertise my store on Pinterest. 🙂 It doesn’t seem organic to me and didn’t work for the 4 or 5 pins I tried early on. Never drop ship. Ever! It’s 99% of the time just a scam and a major nightmare. Plus, even if you do find a good one, the products they sell are so generic. Like…go to Ross and buy a mug for $2.99 with sparkles on it. Who’s gonna pay $14.99 for a mug with blog’s logo on it? Hint: just your mom. 🙂 Don’t bother. It’s just a waste of time. I go through MediaVine. My blog qualifies for the traffic part requirement (so does my store on it’s own) and so I just had them add a couple media ads to my store. Putting ads in my store has not hurt sales for me or my clients who do it. Nope, I’m TERRIBLE at technology! I licked it! 🙂 It’s fairly easy and I have a Shopify Binder and Shopify course that goes over a lot of the tech stuff. Previous Post: « How Often Do I Post On My Blog? $3.1 million dollars in 17 months? That’s INCREDIBLE! Thank you for sharing your journey and including all of the tips and information that you do, you are very generous with sharing advice. Amazing post! Thanks for sharing from your experience with Shopify, Sarah. $3.1 million in 17 months is definitely incredible!